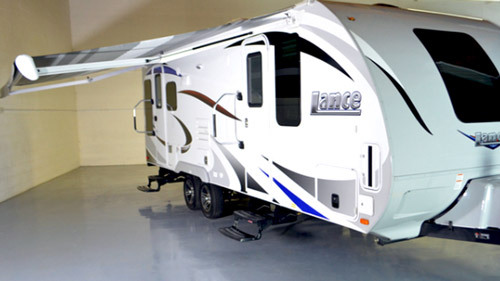 Lance Camper Manufacturing Corporation (based in Lancaster, California) have been designing and manufacturing RVs for over five decades. Years of experience combined with managers’ visions and skillful workforce firmly put the company on the list of top US manufacturers of truck campers, travel trailers and toy haulers. 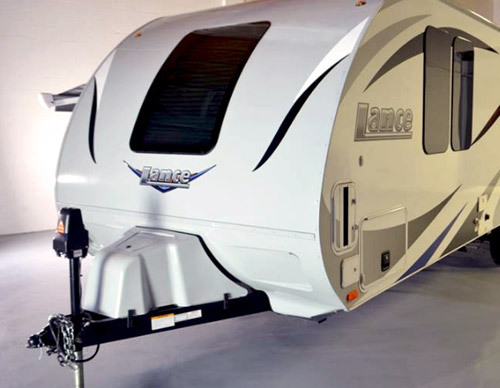 Today, Lance is one of the leading producers of ultra-lite RVs. 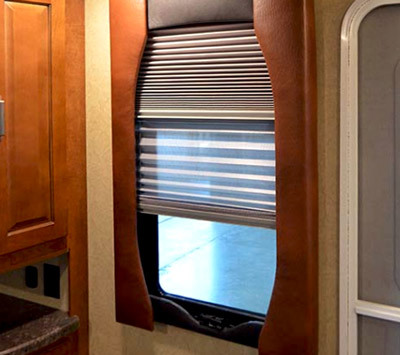 By extensively using most advanced, lightweight construction materials like aluminum, Azdel, Lite-Ply, fiberglass and other composites, the company was able to significantly reduce the weight of their RVs and increase their durability (thanks to no rot, no mildew, no corrosion). The company also lunched the Eco-oriented design program completely eliminating mercury and making their RVs toxin-free. For the 2017 presentation from the series of Lance travel trailers we selected the largest model - 2375. It’s a single slide-out camper with rear-lounge layout. Actually it was very difficult decision, because just slightly shorter model – 2295 (single slide-out, rear-bath) was also strong contender for the list (see short description at the end of this presentation). Both models have some characteristics of residential-like RVs (furnishing, features, finishing touches, stylishness and elegance….) what puts them into the class of higher-end RVs. Also, both models are designed for family of two (or 2 + 2 young kids). It is because of the open-space design with no separation between master bedroom and the living space. The 2375 travel trailer has two entrance doors – one leading directly to the bedroom and the second one to the living area. Given the fact that the camper is designed for maximum 2+2 kids it is probably overdone but I guess many will find the merits of such design (and certainly there are some). The walk-around queen-size bed with innerspring, pillow-top mattress seems to guarantee full sleeping comfort. It also promises good conditions for just relaxing, reading, watching TV or afternoon nap. Two wardrobes with hanging rods on both sides of the bed offer storage for frequently used clothes. Similarly, two nightstands with solid-surface tops will give you place not only for favorite books and magazines (you have two LED reading lights) but also for glass of wine or cup of fresh morning coffee. The nightstands drawers are always welcomed for all kind of personal stuff, jewelry and so on. BTW – the wall-mounted rack for magazine gives you chance to keep them organized. Thanks to two charging stations (12Vdc and USB) as well as two 120V receptacles you can keep in touch with the outside world (think iPads, more or less “smart” phones, computers etc…. And when it happens that you have to hook-up your CPAP “machinery” – you have all power you need to do so. We mentioned watching TV – although personally I think that TV is not such great thing in the bedroom, this observation does not easily apply to RV’s. Due to the limited space (especially in bad weather conditions), the well-designed sleeping area can be considered as a “Horizontal-Living” space. Well, the optional TV mounted on swivel-arm will certainly give you opportunity to watch your favorite programs. 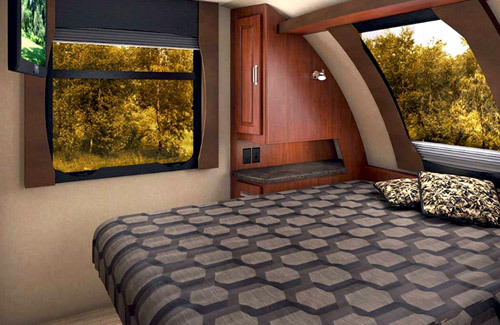 But the real “star” of Lance’s design is a large, SkyView window right above the bed’s head. It completely changes sleeping ambiance at night (imagine watching starry Milky Way, or rushing through atmosphere meteorites). And on the similar charming note – what a pleasure waking-up in morning sun, or just surrounded by the Mother Nature. Do not worry, the window is tinted so it guarantees the privacy, but on top of that, you can also use shades. 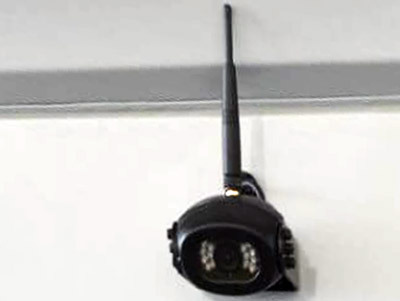 They will prevent not only “intruder’s eyes” (if any) but also sun from waking you up too early. Two windows on both sides of the bedroom together with the SkyView one make the bedroom very bright and what is equally important – appearing to be bigger than it really is. Moving towards the living area at the border between the bedroom and galley there is a set of cabinets and countertop space. The latter (located next to the entrance door) is very handy and will serve well for leaving things when coming from the “patio” (area under the awning) or from outdoor activities. Both cabinets (under and overhead one) are nice addition of storage space for bedroom’s stuff or general use. Just to be clear – bedroom does not have shortage of storage. 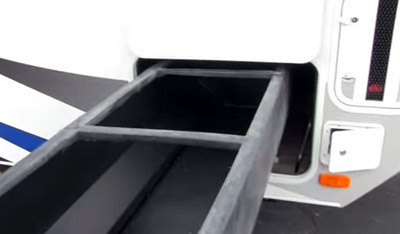 The large under-bed box is easily accessible thanks to gas-struts and although it may not be too convenient for keeping stuff used on the daily basis, it is really spacious. Well, as mentioned earlier, the 2375 coach is designed as an open space. However when needed, you can use the hanging curtain to set a “privacy line” which runs between the bath and bedroom’s entrance door. The bathroom with the “cabin-less” shower has probably the least-residential look. The plastic curtain over the tub is not an example of stylishness, but it will certainly do the job. 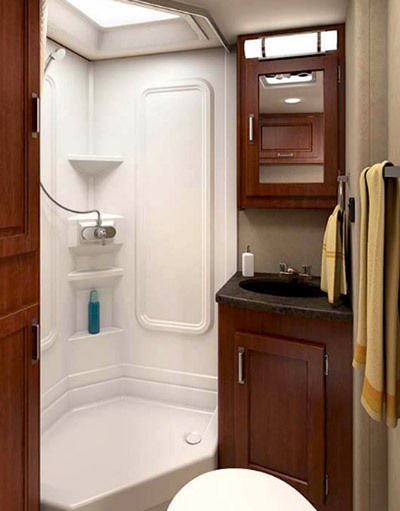 The porcelain foot-flushed toilet, vanity with sink and medicine cabinet with mirror door are standard elements of RV’s baths. What goes beyond “typical” is the nice American Stonecast counter-top with integrated sink (vanity), extra storage on the wall behind the toilet and large full-height linen cabinet next to the door. The fixtures for bathrobes and towels are very practical. On the negative note: The bathroom has only one entrance door (unfortunately it opens very inconveniently when coming from the bedroom (sliding doors will be by far much better). While it’s a walk-in bath, the free space seems to be a bit too tight. The galley is well equipped and its stylish line is enhanced by stainless-steel appliances and very-residential-looking angled countertop. The 3-burner range with cover and backsplash, hood with light and exhaust vent, built-in microwave (optional) and 6 cubic feet combo fridge with separate freezer will meet even demanding requirements. The American Stonecast countertop with integrated sink is not only elegant, but also more “scratch” resistant than stainless-steel so you can expect lasting elegance. The “surface-matching” sink cover extends the working space. The high-rise, single-levier faucet with pull-out sprayer makes easier to wash “stuff” (whatever it is – dishes, veggies, fruits…. you name it). The standing and overhead cabinets together with full-height pantry next to the fridge provide ample storage space. And the 120V receptacles are handy to plug in any additional appliance you may need to make more elaborate meals. 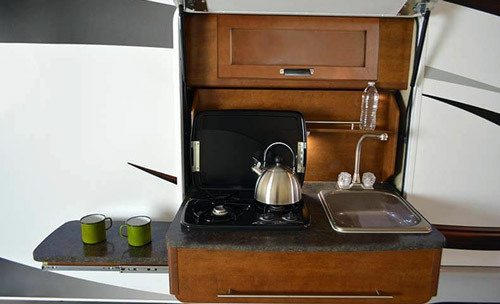 The dinette is located in the slide-out on the street-side of the camper. While it is quite “shallow”, it still offers more than generous room for 2 and sufficient space for 2+2 kids. The under-the benches storage in form of two large roll-out drawers is easy accessible even if someone actually sits on the bench. The “residential” lamp above the table definitely adds some charm to the whole living area. The dinette can be converted into extra sleeping space but as mentioned earlier, it will do job just for kids. 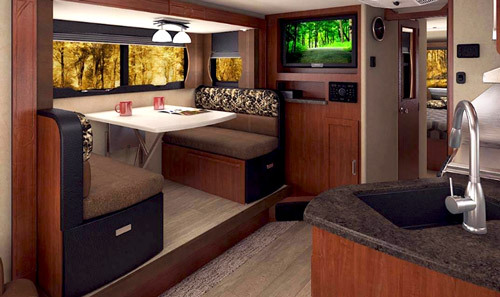 Unlike it can be seen in high-end campers, the slide-out does not open flush with the main floor. Although it’s not the end of the world (actually for some may bring warm memories from the past), you have to remember that there is about one-step level difference. The best part of the living area is the little lounge at the rear end of the camper. Two swivel rocker chairs with small cabinet and a pull-out table in-between makes it to feel like a little oasis where you would like to “hide” and relax after busy days of outdoor activities. Thanks to large panoramic window at the back and two side windows, it is very bright and “open to the outside”, but at the same time somehow “soft” and very private. Those that prefer more comfortable (than dinette) sleeping space for two can opt for an optional Jackknife sofa. But then, you will definitely loose the comfort, privacy and charm of lounge corner. Regardless how your lounge is furnished (Chairs of Sofa) – above you will find all along the rear wall spacious overhead cabinets. Across the living space there is the entertainment center with 32” HDTV, Jensen Multimedia System (all you can imagine including DVD/FM/AM/Aux/UBS/Bluetooth Audio-Video with speakers). The cabinetry offers an extra storage space and always practical small shelf. The 20ft wide power awning (optional) extends the living room to the nature. LED lights and soothing music from two marine-grade speakers will certainly create charming ambiance. Thanks to Bluetooth you can remotely control your Media Center from the patio using relevant applications in your smartphone, iPad or computer (well, these days things are really getting easy)! BTW – apparently the awning is equipped with the wind-sensor, so if the weather changes in your absence, the awning will automatically retract. This clever option can save you $$$ and a lot of headaches. The Lance 2375 is designed for “prolonged” vacation season. 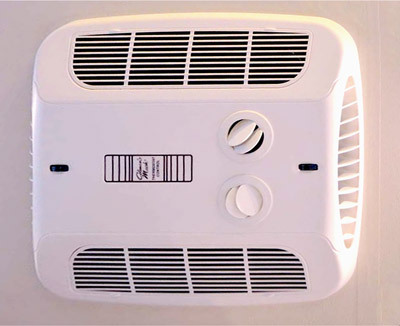 It comes with standard duel-pane windows, advanced duct-heating system and good thermal insulation (Azdel / block-foam). The roof (the main escape route for heat) is made of energy-star rated TPO what helps to keep interior warm at lower ambient temperatures. 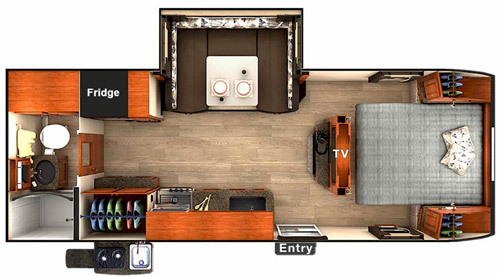 It may be worth to note here, that the A/C unit is optional (ceiling-mounted) and not-ducted. The optional “Weather Package” adds few missing elements making it 4-Season camper. These include water-heater bypass, heated holding tanks and insulated hatch covers. BTW- the water tanks are enclosed in larger box (tank) which is part of the ducted-heat system, so you do not need additional electrical heating pads! The energy autonomy is provided by 2 tongue-mounted LPG tanks (five gallons each). However the tanks’ holder has room for optional 3rd one. 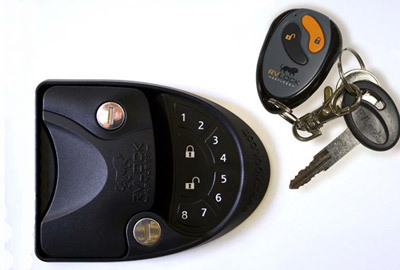 Two batteries are stored in dedicated compartments (one on each side of the camper). The pull-up trays make it easy to inspect and eventually replace when the time comes. It’s worth to mention that the 2375 travel trailer comes with standard Solar-ready installation, so you can easily hook-up a solar panel(s) to keep batteries automatically recharging during the day. As the matter of fact, Lance offers a roof-mounted 160W solar panel, but on the camper side there is an extra hook-up for portable one. The pass-through storage is spacious and unobstructed so it is of great use for all kind of camping stuff (folding chairs, table, bbq and any other outdoor gear). Recognizing that even with two sides access sometimes it may be difficult to dig-out gear stuck in the middle, Lance offers an optional roll-out tray. 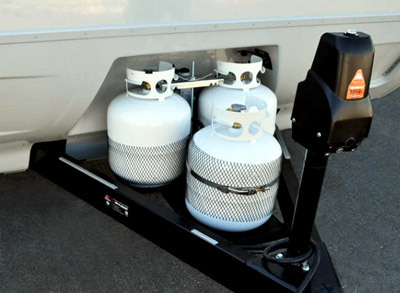 It can be pulled-out on either side of the camper offering an easy access to everything you stored inside. It’s great idea, however may prove to be a “bottleneck” when storing the bulky stuff. Well, it’s just an option that you can use when practical or leave in your garage when not needed. 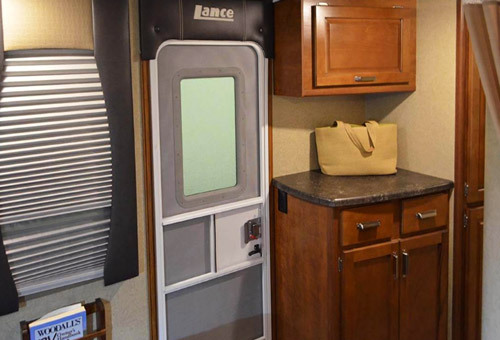 The cabinetry throughout the Lance 2375 travel trailer looks quite residential. Doors, drawers’ front panels and frames seem to be made from hardwood. In reality, Lance makes extensive use of Lite-ply which is sort of processed lightweight wood (mainly poplar, but it can be also balsa). The layers of Lite-ply are first glued and compressed to achieve required thickness and strength and the exterior is usually laminated. Cabinetry made from Lite-ply(wood) weights less than that made from the traditional plywood/hardwood, is also more durable and easier to maintain. 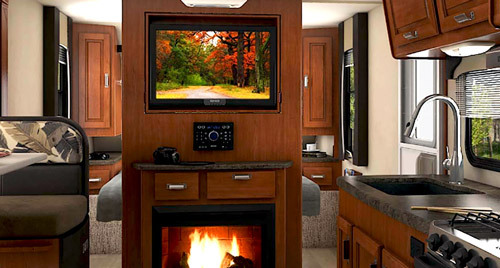 The tempered roof is accessible by HD ladder mounted at the rear wall of the camper. The walk-in roof is not designed to carry extra stuff (company does not offer any roof-mounted rack). You will go up however to inspect the roof, clean the slide-out from fallen leaves, to service the solar panel (if any) or other roof mounted equipment. At roof’s perimeter you will find integrated rain gutters and drip spouts. By controlling the rain water flow the company protects the camper from streaking. 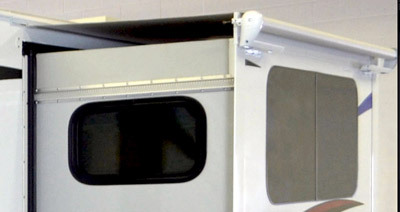 To minimize the impact of leaves and debris collected on the slide-out roof, Lance offers optional slide-out awning. Note that dual-pane windows and advanced duct heating are standard features. As mentioned earlier this coach was a strong contender for presentation of 2017 ultra-lite travel trailers. It weights about 260 pounds less (4.640lbs vs 4,900lbs) and its body is 1 ft shorter (22’6” vs 23’6”) than the 2375 model. Similarly as the latter, it is mainly designed for 2 persons (or 2+2 kids) family. Bedroom is “integrated” with the Living Area (the TV in the Entertainment Center can be rotated 180 degrees to face the bed). Roomier rear-located bath that is really walk-in-type. Additionally, the shower has radius sliding door making the bathroom much more residential-like (if that is what we need). There is much more storage space – (huge closet in the bath, large wardrobe w/hanging rode, exterior storage in the slide-out). 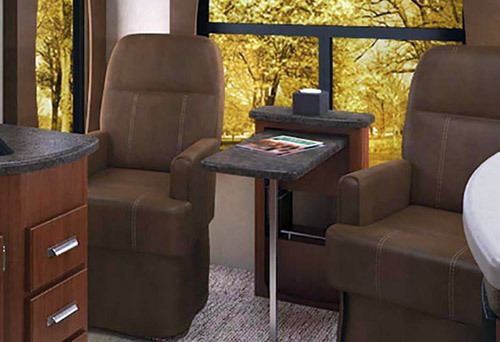 More spacious U-shaped dinette with comfortable seating for four persons. 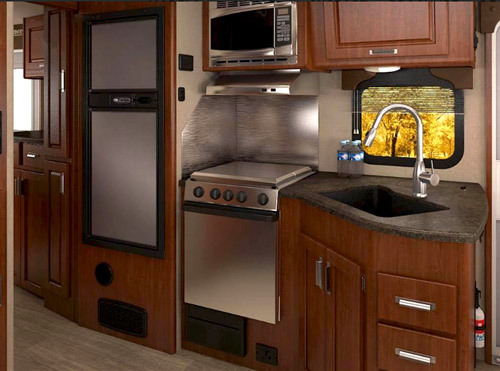 Exterior fully-equipped roll-out galley (2-burner stove, single bowl sink w/high-rise faucet – all connected to the corresponding LP and water systems, cabinetry ….). The only missing part is fridge. What you will miss in Lance 2295 is the rear lounge (frankly, it is a huge asset) and some 40 feet square less of internal space. Well, it’s always something for something.